Prime Minister Narendra Modi on Saturday addressed election rally in Odisha’s Sundergarh. While addressing the gathering, Prime Minister slammed Congress & said BJP fought to protect democracy during Emergency. Prime Minister Modi also asked voters to decide if they want to vote for a hardworking and honest party or a corrupt one. Prime Minister also held a public meeting at Sonepur. He said, Congress and BJD see politics in poverty. He said people of the country support and trust Modi government because it has given free LPG connections to the women and free electricity connections to the needy. 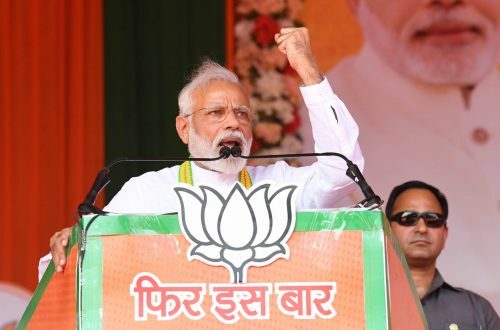 Prime Minister Modi addressed an election rally in Balod Chhattisgarhon. Referring to Congress election manifesto, which promises to amend Armed Forces (Special Powers) Act, PM alleged that Congress wants to weaken security forces. Prime Minister said that Congress and parties supporting it are fighting polls to loot people’s money, whereas BJP is contesting polls to make effective use of every single rupee. Prime Minister Narendra Modi also addressed an election rally at Nanded in Maharashtra. In his address Prime Minister slammed Congress for corruption during its regime and its soft approach on terrorism. भाजपा के शत्रु ने कांग्रेस का दामन थामा !